Hey guys! 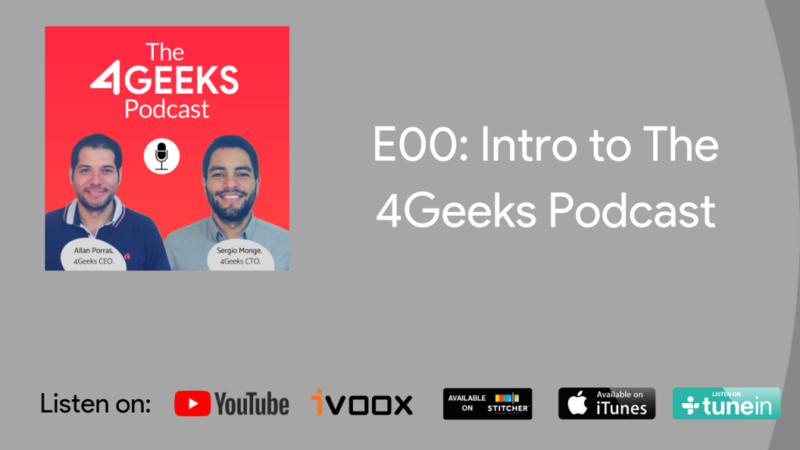 We are really excited to introduce you The 4Geeks Podcast, our new initiative to share knowledge with everybody out there. Sergio Monge, CTO at 4Geeks and Allan Porras, CEO at 4Geeks, will host weekly conversations about technology, business, startups and disruptive products. So, join us on this journey! You can subscribe to this podcast on your favorite platform; iTunes, TuneIn, iVoox and YouTube included. Rate us and Share with your community. E01 episode will be published on first week July, 2018. 🙂 Every Wednesday. Sergio: Hi and Welcome to The 4Geeks Podcast, I’m Sergio CTO at 4Geeks and with me here is Allan Porras, how are you Allan ?. Allan: I’m very well. Hi everyone, I am CEO at 4Geeks and I’m very happy to start with this new initiative: The 4Geeks Podcast. Sergio: It’s really excited to start making amazing conversations about technology, startups and disruptive products. But Allan tell us about 4Geeks at first place. Allan: Sure … 4Geeks delivers high quality business products to another companies around the globe. We focus on product development (from MVP to product release — Prototyping & User testing, User Experience Design, frontend, backend, mobile — iOS and Android), Artificial Intelligence (chatbots, Robotic Process Automation) and Blockchain (Smart contracts). Sergio: We build those amazing products from our offices located in the beautiful Costa Rica., actually we are recording from San Jose at this moment. Allan: In this podcast we will share with you tons of valuable conversations with people that makes intelligent products, people who brings value to 4Geeks community and now to this podcast. Sergio: I want to highlight that this initiative is under our 4Geeks Style. It’s our philosophy about how we see technology and our way to deliver products, but Allan can go detail with it. Allan: Awesome! 4Geeks Style It’s about the right talent, the right experience and the right technology. We are developers, designers, data scientists, and digital consultants. We go throughout the entire product development cycle, delivering amazing projects. Sergio: That’s right Allan. Personally what I really enjoy about our 4Geeks Style is the people, the exactly same people who will be at this podcast as you mention. Allan: So, please subscribe to this podcast directly from your favorite mobile app (iPhone or Android). For example, you can find us on iTunes, Tunein, iVoox or just in our website https://4geeks.io/podcast. Sergio: So let’s get started, see you next week.